Accordian player and Amateur, Mike, asked about the 14% size increase that was expected to be seen for the super moon and we wondered where the 14% number came from. Since the moon does not actually change in physical size during its orbit, how do we explain the apparent size increase? To me, it is caused by the elliptical orbit of the moon, which causes the distance to the moon to vary between a nominal 360,000 km at the closest and nominal 406,000 km at its farthest nominal distance. When a full moon happens at the same time as the orbit is closest to the Earth, the moon will appear to be bigger, and the increase will vary inversely with the distance. So the maximum apparent size increase should be 406000/360000 = 1.13. (Note: An earlier version of this post had the distances to the moon 1000 time less. The ratio was not affected, but the distances were in error. Thanks to Science Squad and Gravity Guy, Ken, for noticing this error. Thanks Ken!) So the 14% number seems to agree with this back of the envelope calculation and I suppose if one were to use more exact distance values, rather than just nominal values, the exact size increase could be calculated. Anyway, thanks for the comment, Mike, which was a great excuse to break out the calculator and do some calculation..
Also, I got a photo taken by Retired BLMer and now Winemaker and Professional Gambler (and also big sister), Ilene. She reported that whe just put here cellphone camera near one of the binocular lenses while sighting through the other lens and snapped the shutter. Hey, that is a pretty good photo. Thanks, Ilene. Several months back, we had received a similar photo of Saturn, taken by Retired Legacy Coder, Now studying Physics Fulltime, Larry, who just put his cell phone camera next to the telescope eyepiece. 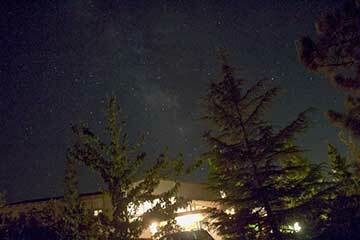 We can see that the amateur astronomer does not need a big expensive camera to get started in astrophotography. The super moon and astronomy was also one of the topics with several different groups of dinner companions. Retired Zoologist, Dr Jack and Nancy were interested in the super moon. Nice to be with you folks! Of course, I had to ask if folks had seen the man in the moon and even the plane in the moon. Ok, ok, we know its not in the moon, but the image is real and took me several nights and several attempts, months apart, to get the air traffic pattern to overlay with the moon position.. Separately, we had a nice dinner conversation with The A-Team from England, Allen and Anne. Allen, who claimed just to be a lay reader in astronomy and cosmology, was quite up to date in some of the controversial claims made in cosmology. He wondered why inflation is described so widely in the popular press as the final answer, while at the same time there is not a shred of evidence as to how inflation started or ended. Yes, I agree completely, in fact this is one of the main points made by Sir Roger Penrose in his latest book. We also were wondering how well the elements, produced in supernovae explosions, are mixed, so that measurements of elemental abundances made in our part of the galaxy are representative of locations in other parts of the Milky Way. In thinking about that, I found that although the number of supernovae explosions are considered to occur about once per century. So, over just a million year period, one would expect about 10,000 supernovas and for a typical galaxy, maybe 100,000 light years in diameter, each of those supernovae, located in various locations, could effectively spread elements and debris throughout the galaxy. Thanks for the good discussion, Allen and Anne! Well, its about time for other shipboard fun activity so that is about it for now.